Why do successes sometimes feel like failures? As philosopher Kieran Setiya points out in a wise new essay, “Our achievements, whatever they are worth, are always numbered” (10). Each time we accomplish something, it’s done, finished, and we must move on to the next thing: “the completion of your project may constitute something of value, but it means that the project can no longer give purpose to your life” (12). And so, in “pursuing a goal, you are trying to exhaust your interaction with something good, as if you were trying to make friends for the sake of saying goodbye” (12). Telic: “Almost anything we call a ‘project’ will be telic: buying a house, starting a family, earning a promotion, getting a job. These are all things one can finish or complete” (12). Atelic: “not all activities are like this. Some do not aim at a point of termination or exhaustion: a final state in which they have been achieved and there is nothing more to do. 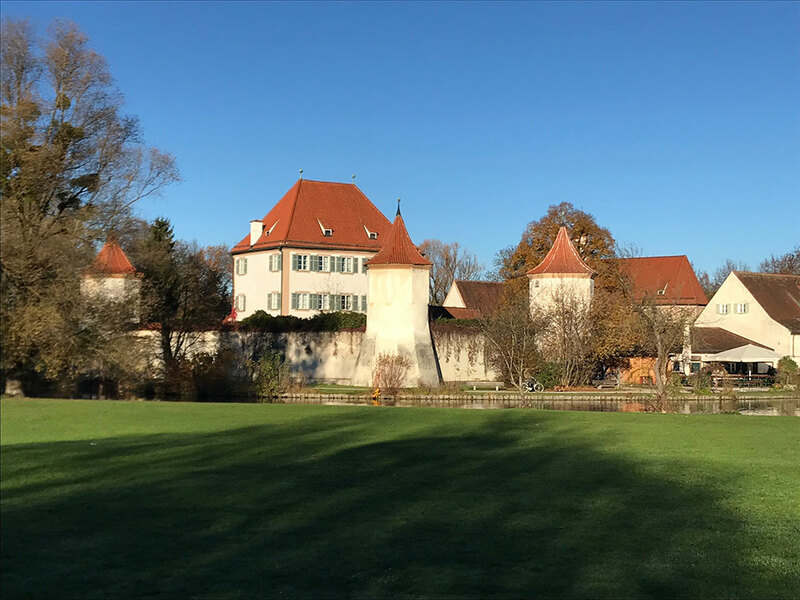 For instance,… you can go for a walk with no particular destination. Going for a walk is an ‘atelic’ activity. The same is true of hanging out with friends or family, of studying philosophy, of living a decent life. You can stop doing these things and you eventually will, but you cannot complete them in the relevant sense…. they do not have a telic character” (12-13). So, “If you are going for a walk, hanging out with friends, studying philosophy, or living a decent life, you are not on the way to achieving your end. You are already there” (13). This, however, does not mean that one should only invest in the atelic. The issue is where you derive value: locating the majority of life’s meaning in the telic will leave you unfulfilled, and often precipitates a midlife crisis. As Setiya writes, “it is at midlife that the telic character of one’s most cherished ends are liable to appear, as they are completed or prove impossible. One has the job one has worked for many years to get, the partner one hoped to meet, the family one meant to start — or one does not. Until this point, one may have had no reason to dwell on the exhaustion of one’s ambitions” (14). To avoid or resolve the midlife crisis, yes, you can (as Setiya puts it), “invest… more deeply in atelic ends. Among the activities that matter most to you, the ones that give meaning to your life, must be activities that have no terminal point. Since they cannot be completed, your engagement with atelic ends will not exhaust or destroy them” (15). But you can — and should — also continue pursuing telic activities. Just pursue them for their own sake instead of for the end product: “Instead of spending time with friends in order to complete a shared project […,] one pursues a common project in order to spend time with friends” (15). As Setiya advises, “Do not work only to solve this problem or discover that truth, as if the tasks you complete are all that matter; solve the problem or seek the truth in order to be at work” (15). 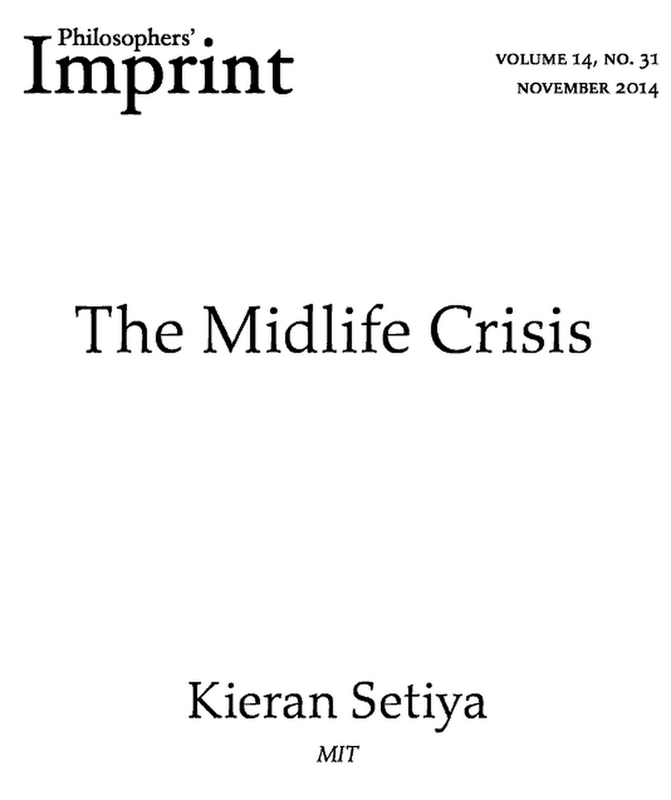 Setiya’s “The Midlife Crisis” appears in Philosophers’ Imprint 14.31 (Nov. 2014), pp. 1-18. Just follow the link. As you may have guessed from my summary, I highly recommend it. In Search of Lost Time (Inside Higher Ed, 3 Mar. 2014). See also In Search of Lost Time: Further Reading (3 Mar. 2014). I am not nostalgic for my high school years. As a teen, I was acutely self-conscious, chronically insecure, often depressed. Yes, I also experienced a wider range of emotions (including joy and laughter) during those years, but my dominant impression of teen-age-hood is gratitude at having survived it. But I returned for my 25th reunion last week. After all, I did have a few close friends, and (via Facebook) have connected with a few others. How many more opportunities will I have to see them? So, I returned. Here are ten observations. 1. As adolescents, lots of people were insecure, full of doubt, consumed by self-loathing. This is not news, but it is affirming to hear others admit this. “I was so angry then,” one classmate told me. Adolescence can be a confusing, volatile time. 2. Memory inheres in places. Many glimpses of the past. At the edge of an athletic field, I vividly remembered a conversation, one evening during the spring of my senior year. I know who I was talking to, can remember what we both were wearing, but have no idea what we were discussing. Walking past the Arts Center’s cement cavern, I remember its echo chamber where, we — the male a cappella group — sang earlier that same year, also in an evening. Standing almost anywhere on campus revived memories. 3. I can’t believe I once attended school here. Choate is an extraordinary place. It has an Arts Center, a Science Center, a Humanities Center, athletic buildings, classrooms, and dorms — all of which rival or surpass those in the best universities. I was a student here because my mother taught here, and children of faculty can attend for free. My parents otherwise could never have afforded such an education for my sister and me. 4. That most children lack access to such high quality education is morally wrong. In addition to the school’s extraordinary facilities, the ratio of faculty to students at Choate is 6:1. Most public high schools are at least 12:1, and some are as high as 22:1. In the past few decades, Choate made the decision to admit fewer students, in part (so I understand) so that it could achieve such favorable ratios. In contrast, at the national and state levels, government has been cutting funds to public schools, resulting in larger class sizes and worse ratios. 6. Teachers made a big difference outside of class. This is a reminder to me, as a professor: often we help our students more as mentors than we do in the classroom. In another blog post, I talked about how the late Terry Ortwein’s decision to cast me in a minor role in Our Town allowed me to glimpse a different self: acting showed me how to shed my shyness and become more outgoing, confident, competent. Of all my Choate teachers, my mother had the greatest influence on me. I had been languishing in public school until she began teaching in private schools (thus enabling me to attend gratis). Having arrived in kindergarten able to read and write, I found public school boring, never learned to study, and just coasted along — daydreaming, paying scant attention. This strategy worked well, … until it stopped working well, and my grades slipped. Public school culture emphasized getting by; private school culture emphasized not only doing the work but striving for excellence. Had my mother’s job not enabled me to attend private school, I doubt I’d have gone to college, much less graduate school. The lessons of private school did not take immediately. Fortunately, John Ford, then a dean, allowed me to repeat my junior year at Choate. Doing so granted me the time to get my act together. (1) I was unlikely to pass three years of Russian, which I’d chosen as my foreign language. So, I switched to Spanish, completing three years’ worth in two years’ time — thanks to a semester in Spain. (2) I also started paying attention consistently, worked harder, and improved my grades to the point that I was able to get into a good college. 7. Professionally, many people have found their niche in life. It may not have been the job they imagined themselves doing, but they find it’s a good fit for who they are. Lobbyist, teacher, IT professional, intellectual-property lawyer, stay-at-home mom, personal trainer, actor, director of community relations for Google, Oscar-winning screenwriter, executive producer of The Life of Pi. Yes, those last few are more exceptional than typical. But a number of my classmates are quite high-powered people. It’s very impressive! 8. No one works 9-to-5 anymore. 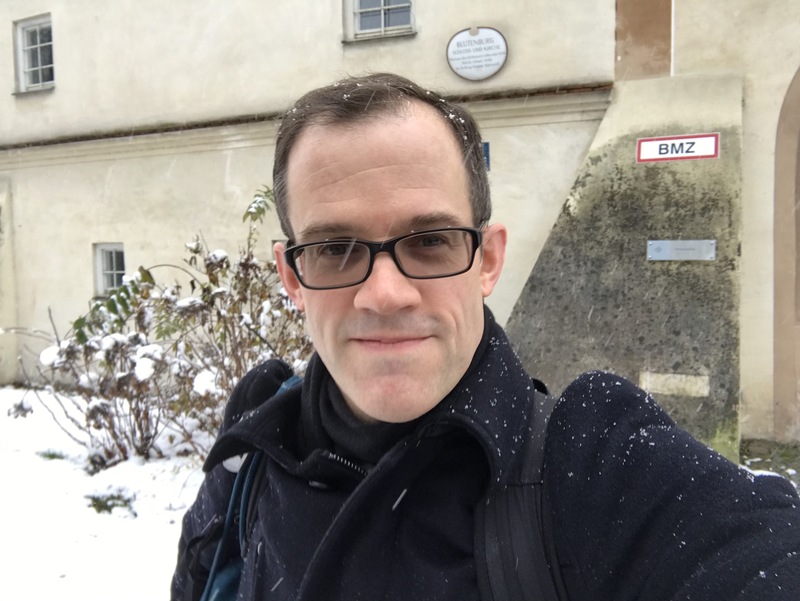 I often think that my 60-hour weeks, in which I work during evenings & weekends, are typical for an academic, but unusual in the rest of the working world. However, such a “flexible” work schedule (in which work expands to fill any available time) is normal in most careers. This is one reason that it’s hard for us to describe what we do. We are all of us multi-tasking, juggling life and work, constantly in motion. 9. Only connect. . . (yes, I’m quoting E.M. Forster). I of course enjoyed catching up with people who I knew, but I also enjoyed catching up with those I did not know. During the weekend, I actually made a few new friends — which, as we grow older, is too rare an occurrence. 10. As the song says, “The years go by, as quickly as a wink. / Enjoy yourself, enjoy yourself (it’s later than you think).” I don’t mean embrace hedonism, but rather we are here now, and then we are gone. Several times during the weekend, I found myself thinking: It is good to be here, right now, in this moment. I hope all of you fare well over the years to come, though I know not all of you will. I hope to see everyone in the future, though I know some of us will not cross paths again. I hope that you find meaning and purpose in your life, that you nurture your friendships and relationships, that you love and are loved. The day after the reunion, I visited a friend whose job prevented her from attending. She was on call that weekend — she’s an M.D. who specializes in geriatrics. Or, as her spouse (an M.D. in pediatrics) puts it, “She has a 100% mortality rate.” Though that can be hard, it’s also very fulfilling. She (and sometimes her children) get to meet people in their 80s, 90s, 100s — people who’ve lived long lives and have stories to tell. Except for one. She told me of a man, very accomplished in his field. I forget the precise job, and (for reasons of confidentiality) should alter the specifics anyway. But he was the president of a major insurance company or corporation, a very wealthy man. In devoting time to his career, he neglected his friendships and relationships. At the end, he lay there dying, not surrounded by friends and family — but quite alone. He turned to my friend, and asked “Is that it?” Then he died. My wish for everyone is this. Live well so that, before you face that final curtain, you have something more to say. 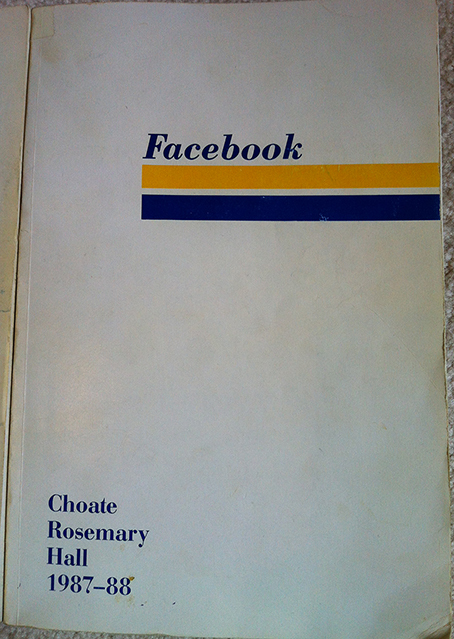 Image source: Choate Rosemary Hall Facebook 1987-1988. 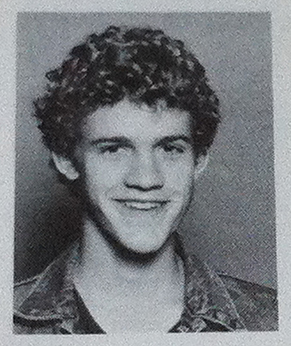 Yes, back before the social media phenomenon of Facebook, the school each fall published a Facebook — for each student, a photo, name, address (both on and off-campus), and class year (or academic speciality, in the case of faculty). The photo above comes from the Facebook of my final year at Choate. 1. My friend is not an other, but half of myself, and thus a second me — I must therefore regard my friend as myself. 9. A friend who gives a gift to another friend and expects something in return has made no gift at all, but is no different from a trader in the marketplace. 17. Only the person to whom one can completely divulge and express one’s heart can become the truest of true friends. 19. Proper friends do not always agree with their friends, nor do they always disagree with their friends, but rather agree with them when they are reasonable and disagree with them when they are unreasonable. Direct speech is therefore the only responsibility of friendship. 26. The stability of a friendship is both tested and revealed by the instabilities of my life. 40. If one has many intimate friends, then one has no intimate friends. 50. Friends surpass family members in one point only: it is possible for family members not to love one another. But it is not so with friends. If one member of a family does not love another, the relation of kinship still remains. But unless there is love between friends, does the essential principle of friendship exist? 62. The honorable man makes friends with difficulty; the petty man makes friends with ease. What comes together with difficulty comes apart with difficulty; what comes together with ease comes apart with ease. 88. Trying to make friends with everyone is complicated. In the end, avoiding people’s hatred is enough. Since children’s literature is a major theme of this blog, I’ll conclude by calling attention to some excellent children’s books about friendship. You likely know Arnold Lobel’s Frog and Toad series (1970-1979) and James Marshall’s George and Martha series (1972-1988), and (for that matter) friendship is a major theme of children’s literature more generally — Winnie-the-Pooh, Harry Potter, and so on. So I’ll restrict myself to a few picture books that may be slightly less well-known. Jon Agee, Dmitri the Astronaut (1996). Dmitri returns from the moon, but will anyone remember him? Jon Agee, Terrific (2005). Sarcastic people can make friends, too. Tim Egan, Metropolitan Cow (1996). An earlier blog post details the brilliance of Mr. Egan’s work; why not read it? Tim Egan, Roasted Peanuts (2006). Again, yeah, that older blog post. Kevin Henkes, Chester’s Way (1988). Introduces Henkes’ best-known character, Lily (later of Purple Plastic Purse fame). 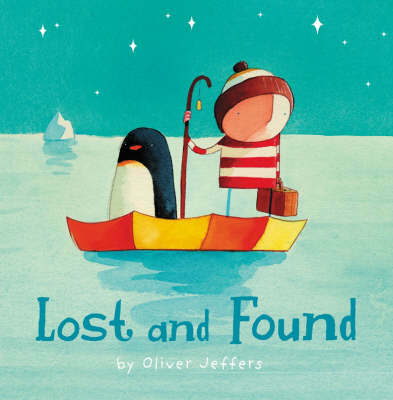 Oliver Jeffers, Lost and Found (2005). Boy helps penguin find his way home, but where is home? Barbara Lehman, Rainstorm (2007). 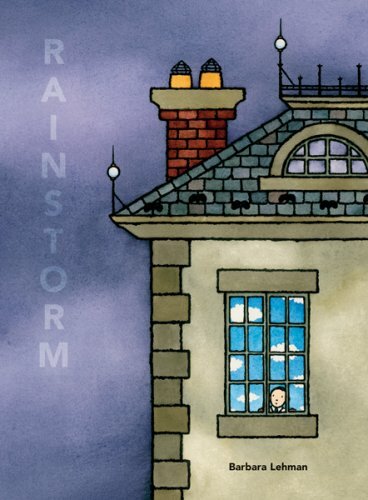 Beautifully illustrated wordless tale of a boy in a big house who finds a key, goes exploring, and is lonely no more. Leo Lionni, Little Blue and Little Yellow (1959). Lionni’s debut, created to entertain his two grandchildren, shows that all you need for a great picture book are: torn circles of colored paper, a keen sense of design, and a story to tell. Leo Lionni, A Busy Year (1992). Friendship between two mice and a tree. Chris Raschka, Yo! Yes? (1993). Brilliantly told with minimal words and emotionally expressive pictures, two boys become friends. Natalie Russell, Moon Rabbit (2009). In which Little Rabbit meets Brown Rabbit. William Steig, Amos & Boris (1971). Amos helps Boris; Boris helps Amos. This is by no means an exhaustive list of picture books about friendship. But, to me, the books on this list are not only about friendship but have come to feel like friends themselves.